Soulpepper is adding a splash of fun to the dog days of summer, with Bed and Breakfast, a comedy by Canadian playwright, Mark Crawford. Bed and Breakfast is a delightful romp about a young gay couple, Brett (Gregory Prest) and Drew (Paolo Santalucia), who are growing ever tired of Toronto’s urban rat race and frustratingly competitive real estate market. An opportunity drives them to move to small-town Ontario and turn a beloved deceased aunt’s house into a bed and breakfast. 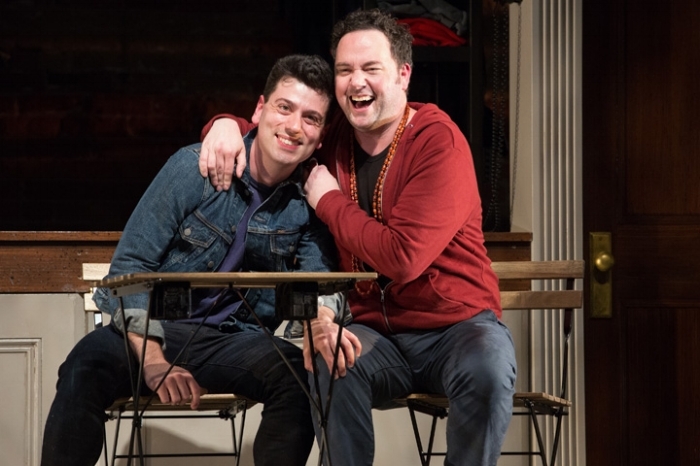 The play itself, which is quite new — premiering in Gananoque a mere three years ago — is interesting enough, focusing on Brett and Drew’s struggle to follow their dream while navigating the pressures and dangers of moving to a town that is much more socially close-minded, while also struggling to find happiness and acceptance within their own families. But the play merely acts as a backdrop for the stellar performances unleashed by Prest and Santalucia, as Brett and Drew tell us how the past year unfolded by acting out the story before our eyes. The real hook is that Brett and Drew play the parts of about 10 people apiece in their story — to wonderfully comedic effect. There are some scenes featuring conversations between half a dozen people where Prest and Santalucia bound around the stage, suggesting character change with vocal affectation and a simple prop (a hat, an earring, sunglasses, etc.). There are also moments when the actors have the chance to sink into one of these other characters for a minute or two, and the change in performance is so profound that you almost think a third actor has wandered onto the set. These skilled performers give us a Brett and Drew who are instantly likeable, and will have you rooting for them in no time. Prest and Santalucia have remarkable chemistry, and it is easily felt in both their comedic scenes, as well as the more serious and dramatic moments. Director Ann-Marie Kerr matches the movements of these human pinballs with the action of the script perfectly. There is a wonderful standout moment where Brett and Drew have an excited, fast-paced conversation that literally builds up — ending with them standing face-to-face on their bed while making a life-changing decision. The set, designed by Alexandra Lord, is a great two-level space that can easily adapt to any location, but also becomes the complete house itself when Brett and Drew take a moment to admire their newly installed Christmas lights. Kudos to the sound operator for the laser-sharp timing with sound cues, which add to the hilarity of the show. Costume Designer Ken MacKenzie has created costumes that are appropriately simple but adaptable, allowing for Prest and Santalucia to suggest character change with a slight wardrobe adjustment. Who knew a red hoodie could be so versatile? If you’re looking for an enjoyable evening with lots of laughs, this is one bed and breakfast you’ll want to visit. Photo of Paolo Santalucia (L) and Gregory Prest provided by Cylla von Tiedemann. The show is being staged until September 2nd, 2018 at the Young Centre for the Performing Arts, at 50 Tank House Lane in Toronto’s beautiful Distillery District. Showtimes are at 7:30 pm Tuesday to Saturday with some 1:30 pm matinees. The show is approximately 2 hours and 30 minutes, which includes a 20-minute intermission.